Essentially London 2050 is a series of projections about the shape of human activity and quality of life in London in thirty-six years’ time. Not necessarily a literal projection to that precise date, but a clear sense of proportion about relative changes, with key ‘drivers’. The London Infrastructure Commission and London Finance Commission. Forward projections of population and jobs which in turn drive pressure on transport, energy, water supply and other infrastructure networks. Lack of clarity about how such required upgrades can be funded and delivered in time, so that London strengthens its domestic, European and World City roles. The need for medium and long term planning and lobbying to retain and enlarge London’s entitlement to national funds and resources in succeeding decades, possibly including some of the economic surplus which London generates. Although we’ll look to provide as succinct a summary as is possible here, readers who wish to review in depth the various project meetings of the steering process for London 2050 will find an extensive set of links at the bottom of this article. Detail on progress with London 2050 planning is set out in the Infrastructure Group minutes – particularly the 3rd December 2013 meeting and the March 2014 Long Term Infrastructure Investment Plan progress report. It had originally been hoped to have a London 2050 draft ready by February 2014. However this did not prove possible, while later publication would cut across the purdah rules of the forthcoming London Borough elections in May 2014. Publication of a draft for consultation was thus felt to be more robust in early Summer 2014. A final report is now expected in Autumn 2014. In the meantime a progress report has been published, coinciding with the London Infrastructure Summit hosted by London First on 27th March. This sets out the rationale for such a long term plan, the scoping of what it is intended to cover, and some short commentary about the progress of studies to date. The Mayor’s 2020 Vision sets out the critical infrastructure required on the road to 2020 and beyond. The London Plan, which is currently undergoing further alterations, sets out London’s needs to 2036. Given the long-term nature of infrastructure planning, the next set of investments needs to be drawn up if London is to sustain and accommodate its growth for the rest of the first half of this century. The Long Term Infrastructure Investment Plan will set out London’s strategic infrastructure requirements to 2050 across the main aspects infrastructure, namely public transport, roads, energy, water waste ICT and partially social infrastructure. Uniquely, it will also provide a bottom up assessment of London’s infrastructure requirements and the funding and financing options to pay for them. It will ensure the infrastructure London needs for continued economic growth is clearly articulated. Our aim is to demonstrate to the Government, Londoners and investors that infrastructure is a key priority and that London has a clear plan to ensure it has the necessary infrastructure to meet the demands of its growing population and remain a leading world city. An external Infrastructure Advisory Group (IAG), chaired by Isabel Dedring, the Deputy Mayor for Transport, is providing further guidance and expertise. It includes experts from the private and public sector and academia in infrastructure, urban development, technological change and finance. More details of IAG membership are included in the links at the bottom of this article. The baseline process was set out in the 12 September 2013 Infrastructure Group meeting, whose minutes closely mirror the March 2014 commentary. These say that London 2050 will be “as much a capital investment plan as an infrastructure plan”. 4.3 The Timescale we look to needs considering. We are currently minded to look to 2050. This is an ambitious horizon to consider – the next London Plan iteration will take us to 2036. The current Transport Strategy horizon is 20 years. However, this is not intended to be a one off piece of work that commits to a series of projects between now and 2050. Instead it will provide a first view on the scale of investment needed to ensure London has the infrastructure it needs to keep pace with a growing population and to remain competitive. It is worth noting that in terms of infrastructure planning and financing, this horizon is not excessively long. We are likely to still be paying for much of the infrastructure currently being planned in 2050. 4.4 It is worth noting that many other cities have recently brought out long term plans, generally also looking to 2050. New York City’s “Plan NYC” covers the period to 2050, with a recent announcement to extend it to 2100. We are looking into how other cities have managed the processes. revisited, periodically, we do not intend for these publications to provide the final answer on London’s infrastructure needs to 2050. Technology, policy changes, economic growth and population growth all have the potential to profoundly change our infrastructure requirements. 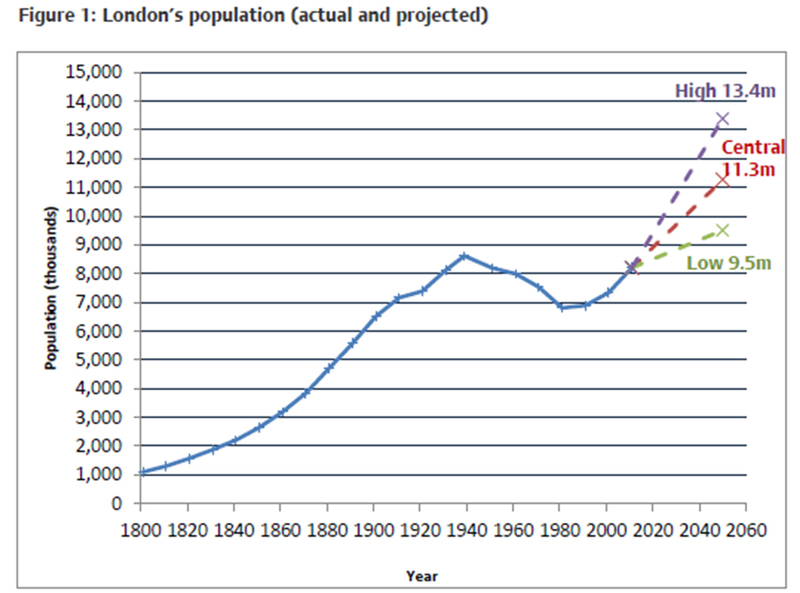 Population growth trends for London, real and projected. Workforce jobs in London (that is, jobs located in London whether or not they are taken by Londoners) are projected to increase to 6.3 million in 2050, from 4.9 million in 2011, an increase of 29 per cent. This equates to a per annum growth rate of 0.65 per cent. In 2012, there were 15 million international visitors to London. This is forecast to increase to around 21 million by 2022. The impact of these numbers on infrastructure will vary by infrastructure type and be greatly influenced by the success (or not) of demand management strategies. The general belief, however, is that there is a high risk of demand outstripping supply. For some sectors such as energy, that risk exists primarily in the short term, not nearer 2050. TfL estimate though that public transport trips could increase by 50-60%, “based on projected population growth with a continuing trend in mode shift from car use given increasingly dense patterns of development” (italics ours). The phrase highlighted above is potentially critical. It is the suburbs where car use is highest, therefore it is the suburbs where public transport will above all have to improve the quality and convenience of its offer. Whilst the March 2014 report doesn’t go into detail, the implications are there. Quite apart from basic capacity issues on main corridors, combine that greater car usage with greater housing density – also a challenge if applied to ‘semi-detached’ land – and the scene is set for possible radical changes in public transport supply beyond the traditional Central London core and, as evidenced successfully by the Overground, the inner suburban area. The succeeding chapters in the March 2014 progress report then address Methodology, Consultation – where there has already been extensive consultation among key stakeholder organisations, and seminars including the London Assembly’s Planning Committee, and a November 2013 call for evidence – then on to Emerging issues, and Next Steps. If there is one thing to take away from these chapters it is probably that the final report is unlikely to be a ‘one size fits all’ approach. We have taken the view that it is sensible to assume that London’s development and new infrastructure requirements will be housing and transport led. Transport enables the unlocking of new growth areas and potential for large scale house building, by linking them to the rest of London. The requirements for other infrastructure types will then be determined by the overall size and density of London and the location of new growth areas. Locations of increased airport capacity. For example, what will the consequences be for London’s infrastructure needs should Heathrow close and a new airport located to the east of London? What would London’s infrastructure requirements look like, if some of the expected growth in population was accommodated by the building of new towns? Current management of infrastructure not being fit for purpose. 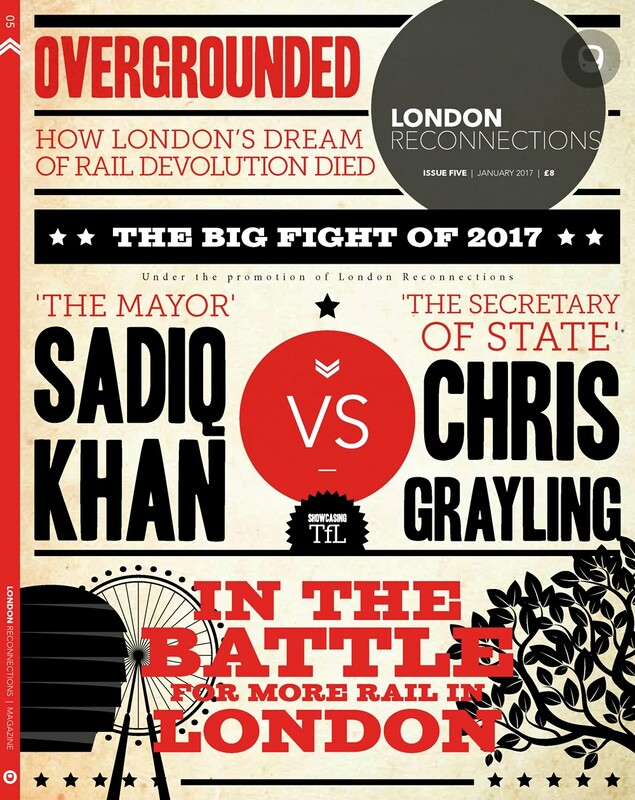 Lack of a primary source of governance for London’s infrastructure, if you need to invest in lots of elements simultaneously in a joined-up way – the division of London rail infrastructure responsibilities between TfL and Network Rail being one example. Requirement for integration of physical and digital infrastructure. Shortcomings with funding mechanisms for infrastructure in short and long term. Providing for London’s long term infrastructure requirements is made all the more difficult in a world of uncertain funding. Bidding to Central Government on a project by project basis does not provide a basis for integrated infrastructure planning where the strategic needs of the city are assessed and prioritised. The process of bidding for funds is in practice often prolonged and arduous. The high levels of uncertainty of success can be demotivating. Bidding to siloed Whitehall departments which have few incentives to plan for integrated systems of infrastructure and housing is also sub-optimal. The London Infrastructure Summit, hosted by London First on 27th March, gave the first (albeit limited) public airing of the latest thinking about London 2050 outputs. There was a galaxy of VIP speakers. The most extensive presentation was by Isabel Dedring herself, the aforementioned leader of the Infrastructure Advisory Group. Her speech can be listened to via this link, provided by London First. “The purpose of the 2050 plan is to highlight the scale of the challenge that London’s facing, and hopefully to get some kind of consensus around both the challenge and what we do about it. “Firstly the challenges facing the city, including protecting its world city status – population growth has already been alluded to. In my area, in transport, we are looking at an increase of more than 50% in public transport trips on the network. Clearly the existing network as constructed cannot handle that, so what does that mean, in terms of what needs to happen on the transport side, just as an example. “Secondly the plan will look at what’s needed across every sector [housing, energy etc]… In my area again, just as an example, we’re looking at East London and the crossings that are available in East London. Clearly, we need a much longer, more strategic programme of crossings in East London, in order to unlock the potential out there, that includes both public transport as well as road crossings. “We need to fundamentally review what we are doing with the rail network in London. The biggest opportunity in terms of increasing high speed capacity in London is to look at the existing rail network, improvements to the existing rail network. “Effectively the rail network will need to become a second Underground network. Because the Underground still has some opportunity in terms of capacity, we can get more out of the existing, new signalling systems, but there are limits to that. The sort of theoretical limit is roughly 40 trains an hour, and we’ll start bumping up against that quite soon. “Thirdly the plan also will look at what all of that implies, in terms of the total cost, and how much revenue is available. The early estimates are looking like … something in the sort-of £900 billion territory, that’s very early estimates. To me that feels about right, and then the question is just in quantum terms, how does that relate to the overall funding that’s available. So are we 50% gap? 80%? 10%? And then what might we start to do about closing that gap? “Finally it will look at cross-cutting governance issues. What do we need to put in place to get infrastructure to work more effectively across the city? So that includes making infrastructure – all these different areas I was alluding to earlier – more joined up, so that we are planning in a more strategic way across different areas. “… If there’s a housing problem in the city – there clearly is – how do we use transport to unlock that, rather than thinking about housing in its own silo? Elsewhere, the Mayor of London, Boris Johnson, was focused on achieving Crossrail 2 by 2029. He was also ebullient about London’s spatial and economic expansion, with impacts metaphorically as far afield as Birmingham and northern France, which are best understood by listening to this audio link. Those who attended the public session of the TfL board meeting on 26th March 2014, a day before the London Infrastructure Summit, also heard some robust exchanges between TfL Board members Boris Johnson, Sir John Armitt, Daniel Moylan and Charles Belcher, on the subject of more TfL control over National Rail in London. The Mayor was focused on the following day’s events, when he said that: “To address London growth, especially in the outer suburbs, we must get more control over lines in Outer London. The success of the Overground shows what is achievable. Outer London is criss-crossed with tracks which are not properly used.” There was scope for more services, and TfL would discuss options with the Department for Transport. Sir John Armitt responded that it was wrong to take over more of National Rail, “it’s there for non-Londoners’ needs, so focus instead on increasing influence”. Boris replied that he’d “buy that rather than what we’ve got now”. Daniel Moylan dissected the issue; “Influence means practically nothing on the main lines. The DfT needs to outsource revenue risk. In TfL we welcome revenue risk.” There was a philosophical issue about the limits of London’s network or a national network. The boundary needs “to be economic, based on different types of value attributed to different services”. The essential ‘control list’ included control of stations, staff and staffing levels, rolling stock, and systemic outputs. The Mayor commented that few people would doubt that urban rail services were just as good, if not better, when overseen by TfL. There had been a lot of hysteria in consultation around London about TfL involvement with the main line services. Looking forwards, the only alternative to a much greater role for TfL in those, “is to build our own network” with more trams, more tubes, at vast cost. “Outer London is where growth will be maximised”. London was as dependent on the Overground as it was on the tubes. He said that TfL intended to refute, via the outcome of the West Anglia concession, that TfL management of a Network Rail line caused any detriment to longer distance flows. London Overground, including West Anglia to come – where he agreed TfL should also oversee SE suburban lines. Direct control was the requirement there. Long distance, eg Intercity, where influence was appropriate, not more, as trains might only stop once within London. Outer suburban, which could do a lot of work inside London as well as outside, where some statutory rules and agreements were necessary. “The key is choosing which is right for us” on each route. This mini-debate at the TfL Board should also be taken in the context of a forecast rapid growth in population in Outer London, as anticipated in documents such as the current LEP bid for Growth Deal funding, which looks strongly to locations such as Opportunity Areas, for much additional housing and jobs and the London Boroughs’ expectations for housing expansion by 2041. This article started as a response to ‘Latecomer’, on our Off-peak London Overground and DLR article, who has contributed some really important operational and timetable planning insights as a LOROL train driver. See here and subsequent comments. The following comments were particularly pertinent: “We would all love to drive on greens all the time, but it just isn’t possible if we are to keep the volume running through” (italics ours). The issue of ‘driving on yellow’ on the main rail lines in London appears to be part of the reasoning behind a Network Rail desire to try to keep to a 2½ minute headway in timetable planning for stopping trains – quite apart from performance fines and perturbation issues. In the ‘old slam door days’, of course, passengers were alighting from trains even before the carriages stopped, let alone find themselves restricted to two double-doors per car, so platform dwell times were also low and 2 minute headways on suburban lines were more feasible. Two doors per car side, however, and a 2½ minute headway world cannot be sustainable in future, with the more pressurised public-transport-capacity-driven world that the London Mayor and Deputy Mayor now see for the future. Transforming London’s national rail lines into a ‘second Underground’ is a fundamental policy and ownership and operability challenge going forwards. The route capacity relationship between inner and outer commuting flows, and with intercity train slots, marks the basis for a strategic debate about the transport and economic geography priorities in the London and Home Counties catchments. Possibly it could lead to several new main lines being required, not just a single HS2. The Network Rail Long Term Planning Process forecasts for 2043 already make clear the longer distance commuting and economic growth pressures and, for London and South East. The Freight and Long Distance Market Studies are also important. The future role of balise technology and Automatic Train Operation (ATO) in enabling closer signalling headways, using trains that allow faster boarding and alighting (such as Crossrail’s three-door-per-side rolling stock) are just a couple of examples of practical ways to achieve higher train and passenger capacities. Station platform and passageway sizes, junction relief, passenger handling and congestion management will also be critical skillsets. As John Bull is fond of saying (something that those who have attended our regular monthly meetups can attest), there comes a point where it matters less how many people you can get on or off the train and more how many you can get on or off the platforms. These are not appropriate at this overview and ‘quantum’ stage of London 2050 thinking, but such planning will be needed, not least about the funding for associated infrastructure changes. Other infrastructure elements such as housing, energy and water supply will have to address their own demand and supply crises as well. The debate about the capacity, funding and control of transport supply in and adjoining Greater London, as part of the wider objectives for London quality of life and economic development during the 2020s to the 2050s, has now well and truly begun. Its visibility will be greater still when the draft 2050 Plan is published for public consultation in early summer 2014. Without pre judging the final analysis and findings, it is likely the level of infrastructure investment will be very high, and higher than expected. We will have to set out the key priorities and develop a co-ordinated approach to deliver these priorities. Through the process we have been seeking to identify the main barriers to delivery. This is clarifying the steps that will be necessary to ensure delivery. It is likely that we will identify both short term, as well as longer term barriers. As well as setting out the long term systems of infrastructure London requires, to maintain momentum we need to identify and commit to the key projects we can start planning, sourcing finance for and delivering. Below are a selection of links to further reading, for those who wish to delve into London 2050 further. We at New Lower Thames Transport Tunnel have secured the £6.7bn for a road and rail Lower Thames Crossing that can take Crossrail from Gravesend through to Essex. we have Chinese Government Backing unlike last time with significant investors from China. the Chinese are talking to Westminster now about taking our proposal forward now. please see our proposal and opportunities it offers as I am talking to ports to take the container shipping I’m bringing to UK instead of EU. Iv been invited to meet the Greek President when I see the shipping owners on Nov 10.